As a criminal law practice, we all hold a mutual belief that every accused has a fundamental right to a fair go, to be treated fairly and is entitled to a fair trial. A fair trial can occur before a jury or before a Magistrate. We all have the right to be tried before our peers. No matter what the allegation is, each of us is entitled to have our rights respected. We appreciate that every case and every client is unique. We pay attention to the details of what you tell us. We continue to defend our clients with the utmost integrity and with a passion that ensures the protection of your freedom and right. If you are looking at some serious penalties or time in prison, you will want to have the best criminal defense lawyer fighting for you. If you are looking at prison time or a hefty criminal penalty, you should most likely look to hire the best Brampton criminal lawyer possible, unless your income qualifies you to get a court-appointed lawyer. To put it simply, the legal system is designed in such a way that, even if you have a great mind and a high IQ, representing yourself in a criminal trial in a competent manner is almost impossible. When it is all said and done, getting an attorney to represent you in your criminal trial is a necessity. Because no one criminal case is exactly like another, criminal defense lawyers are trained to pick out the special portions of each case that make them unique. In addition, the best criminal lawyer in Brampton for you may be able to spot certain arguments and factors that could mitigate or even negate any potential crime. Figure out a good sentencing program for your situation. In the event that you are found guilty, your criminal defense attorney in Brampton may be able to work your sentence in a way that would prevent you from winding back up in the criminal justice system. Being charged with a crime — whether major or minor — is a serious matter. A person facing criminal charges risks severe penalties and consequences, such as jail time, having a criminal record, and loss of relationships and future job prospects, among other things. While some legal matters can be handled alone, a criminal arrest of any nature warrants the legal advice of a qualified criminal defense attorney who can protect your rights and secure the best possible outcome for your case. What is expected after trial or conviction. For instance, instead of going to prison for 10 months, your criminal defense attorney may suggest that you go to prison only for 6 months and spend the remaining 4 months in a drug treatment facility to help you with the drug problem that landed you in trouble in the first place In Brampton. Before selecting a criminal defense lawyer, you should feel comfortable enough speaking with him or her concerning all aspects of your criminal charge. Do you have any experience handling cases similar to mine? How much of my criminal case will you actually handle? How many jury trials have you litigated? How often do you work out plea agreements or ask for a lesser charge? What are your attorney’s fees, and how are they calculated? Do you offer a payment plan? Would you be willing to provide references from clients you’ve helped? Help you with the emotions that often go along with criminal trials. Defendants in criminal prosecutions often feel embarrassed, depressed, and fearful and can also suffer from low self-esteem. The cost of hiring a criminal lawyer will vary depending on a number of factors, including the attorney’s experience, reputation, track record, and geographical location. Most criminal defense attorneys bill their time either hourly, or by a flat fee arrangement. Depending on the fee arrangement, some attorneys may allow you to get on a payment plan to handle ongoing charges. Others may require an upfront retainer fee before working on the case. In all cases, it is wise to consult with a variety of criminal defense lawyers in your area to find one you feel comfortable with in representing you and get a sense of the cost involved in representing your case. Law office near me attorney providing clients with wide range of legal services. As you can see, a good criminal defense lawyer can not only make your job easier but also improve your chances of winning your case or obtaining a more favorable plea bargain. Even if you qualify for a court-appointed attorney, there’s nothing keeping you from speaking with an experienced attorney to obtain a second opinion on your case. 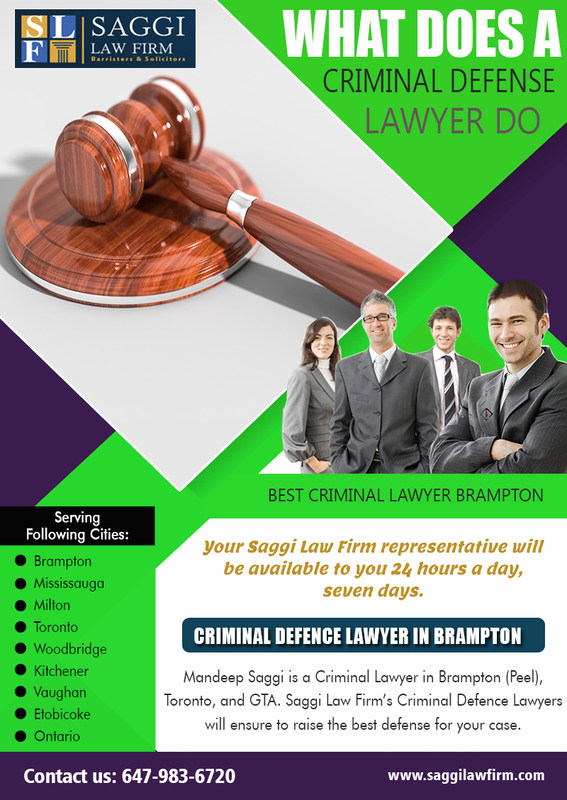 Get started today and find an experienced criminal defense lawyer in Brampton near you like Mandeep saggi. If you’ve been arrested or charged with a crime, you need the immediate assistance of a criminal defense lawyer. A good criminal defense lawyer can explain your rights in all stages of the criminal process and help make the difference between a reduced plea bargain or dismissal and a jail sentence. Work with you and the prosecutor to negotiate a “deal.” These deals, also known as “plea bargains” can often reduce your potential sentence or eliminate some or all of the charges brought against you. However, prosecutors are often unwilling to negotiate with defendants that represent themselves. Figure out a good sentencing program for your situation. In the event that you are found guilty, saggi law firm criminal defense attorney may be able to work your sentence in a way that would prevent you from winding back up in the criminal justice system. Provide you with a reality check. When looking for a criminal defense lawyer, you’ll want to find the best one for your case. As such, you should concentrate on the lawyer’s expertise, skill level, and knowledge. Defendants in criminal prosecutions often feel embarrassed, depressed, and fearful and can also suffer from low self-esteem. Help you develop a sound defense strategy. Also, because of the nature of what’s at stake, it’s important that the attorney you hire has the necessary skill level needed to defend the case, and is the one who actually conducts most of the work. For instance, you may need someone familiar with crime scene investigations, witness/victim/police interviewing, and/or extensive knowledge of polygraphs, sketches, photographs, and video. Help you with the emotions that often go along with criminal trials. A criminal defense lawyer in Brampton handles a variety of criminal cases, including felonies, misdemeanors, drug charges, white collar crimes, and many other state and crimes. Saggi law firm lawyers often know what is going on much better than you will during your criminal trial. Defense attorneys have the advantage of remaining objective throughout a proceeding and can offer insights into how the trial is actually going and what is likely to happen in the near future. These assessments and reality checks are often essential when a criminal defendant is trying to decide whether or not to accept a prosecutor’s plea bargain. Point out important legal rules and regulations that you would most likely never find on your own. Many rules and laws about criminal prosecutions are buried within regulations and laws, and even prior court opinions. For example, if you were to represent yourself, you may never know if the search that the police conducted of your apartment was lawful or not without understanding the many nuances and intricacies surrounding the 4th Amendment. Navigate your case through the state legal system where your case is being heard. In addition to written rules, such as the local rules of court, that must be obeyed and followed, there are often many “unwritten rules” that go along with each jurisdiction in Canada. For example, if only certain prosecutors are able to make and approve plea bargains, Mandeep Saggi lawyer may save your time (and maybe even jail time) by talking to the right person the first time. Explain about some of the “hidden costs” that come along with pleading guilty. Many people that represent themselves never think about the consequences of pleading guilty if it could lead to a shorter sentence. For example, if you plead guilty, you may find it very hard to find a job once you have completed your punishment.